AUSTIN — Some people collect trading cards, others collect stamps or comic books. 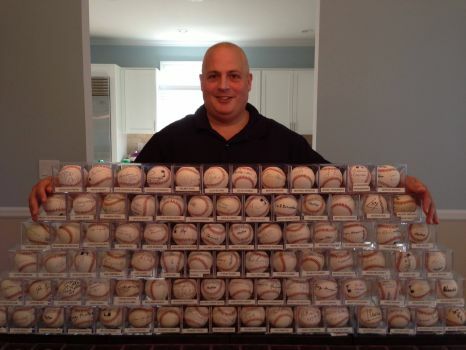 New York lobbyist Randy Kaplan collects baseballs — signed by world leaders. Part of Kaplan’s collection — consisting of 116 former and sitting domestic and foreign officials — is on currently on display at the Lyndon B. Johnson Presidential Library and Museum at the University of Texas at Austin. “I’m so passionate about this and I want to share it with everybody,” said Kaplan, who works for a real estate company in Long Island. Kaplan has over 150 baseballs signed by top politicians and figures from around the globe, including President Barack Obama and several former presidents, former South African President Nelson Mandela and Tibetan spiritual leader the Dalai Lama. The New York lobbyist said the idea came to him while he was visiting an exhibit featuring opening day tossed by former U.S. presidents at the Baseball Hall of Fame in Cooperstown, New York. He had his first baseball signed by then-President Bill Clinon in 1996 and has been collecting ever since. Having leaders sign baseballs is a long process, Kaplan said, that requires patience and good networking skills. Those skills have come in hand time and time again: Kaplan once gave a baseball to U.S. Rep. Gregory Meeks, D-New York, to hold onto in case the congressman met former South African President Nelson Mandela. Years later, Mandela visited Washington and met with Meeks, who gave him the baseball to sign. “Mr. Mandela said to Congressman Meeks after he signed it, ‘I better not see this for sale on eBay,'” Kaplan said. Kaplan continues to keep growing his collection, including new baseballs and integrating baseball bats signed by leaders, would like to write a coffee table book about his collecting. For now, the collection stays on the road: after the exhibit in Austin ends in December, it will move to the Herbert Hoover Presidential Library and Museum in West Branch, Iowa. A portion of the collection is currently at the Richard Nixon Presidential Library and Museum in Yorba Linda, California, and has previously resided at the William Jefferson Clinton Presidential Center in Little Rock, Arkansas. “I love that I’m able to share my passion with people around the country,” Kaplan said.